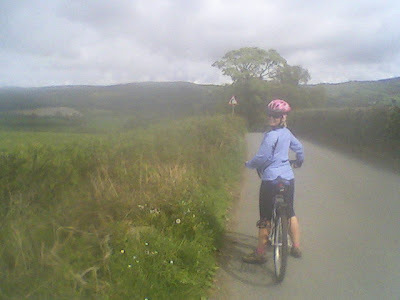 A lovely short ride with fantastic views of the Conwy valley, river and estury. It starts at one of the top birdwatching spots in the area (one of the few places to see Hawfinches in Wales) and also the site of huge Roman settlement. The route also passes the famous Dutch Pancake House which is a must for any visitor to North Wales. Warning!! There is one very steep hill. Start: Caerhyn Church Car Park, easy parking everyday except Sundays. Leave the car park and follow the lane back down to the main road. 0.28m At the T junction turn right. 0.44m Turn right signposted Rowen. 1.68m At the T junction turn right. 2.61m Turn left signposted Henryd. 3.49m After the good decent turn right at the T junction signposted for Henryd. The steep hill isn't far away! 4.27m If you're still breathing, Turn right at the T junction. 4.88m Turn left, the lane gradually climbs for a while but then there is a wonderful decent with views of the Conwy Estury at its finest. 6.69m At the T junction turn right, road climbs for a bit then even's out but has a short nasty incline just before the next junction. 7.47m Turn left at this T junction. You can virtually free wheel for almost a mile now. 8.27m Turn left down lane, following small sign for Caerhyn Church.